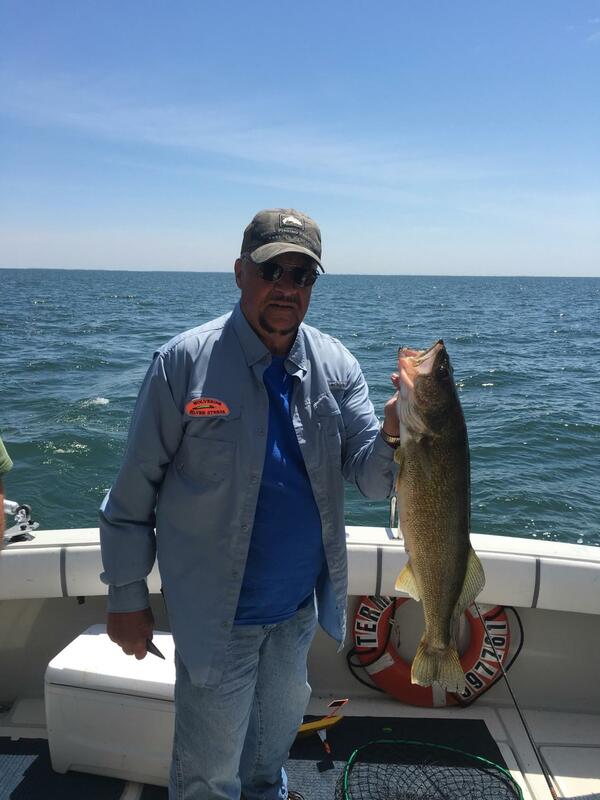 Saginaw Bay walleye were caught in 12 feet off the Pinconning Bar and Gambil’s Marina, 17 to 20 feet off Linwood and 21 to 24 feet near the Spark Plug. At Finn Road, walleye were caught shallow in four to six feet in the early morning but they move out deeper as the sun comes up. Crawler harnesses are working best at all locations. The hot spinner colors were chartreuse, purple, brass and pink. A few walleye along with a lot of white bass and freshwater drum were caught at the Hot Pond by those casting crank baits. 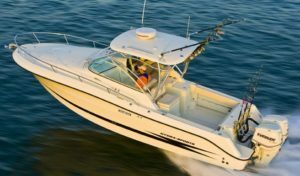 At Quanicassee, some boats were skunked while others had limit catches along the Slot between Sunset Bay and the tip of Fish Point. 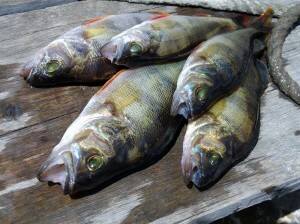 At Bay Port, a decent number of walleye were caught in Wildfowl Bay. A few bass were caught in the marina basins and around the islands. Bass anglers were out but it appears that the late spring and cold water has delayed the spawn because the fish have not moved closer to shore in large numbers yet. Tittabawassee River lots of white bass have been taken from the lower river near the Center Street launch in Saginaw Township. Some large pike and a few walleye were also caught. Fishing was slow up near Gordonville Road. Au Gres Area walleye fishing picked up straight out in 25 to 30 feet but the better fishing was to the south near the Pine River and Catfish Hole in 15 to 20 feet and out near Buoys 1 & 2. Oscoda had very good fishing. Boat and shore anglers have come in with limit catches. Good numbers of salmon, steelhead, lake trout and walleye are in the area. Most were caught in 80 to 100 feet. The fish seem to be from the top to the bottom so spread your bait throughout the water column. Spoons, body baits, cut baits and flies are all taking fish. Pier anglers have done well for walleye in the early morning or late evening when drifting crawlers and leeches under a slip bobber or casting small spoons, body baits and stick baits. Au Sable River steelhead are still being caught. Those fly fishing have done well but fish were also caught on crawlers, wax worms, and small spoons. Tawas Area boat anglers are taking some lake trout, steelhead and a couple walleye in 50 feet. A few walleye were caught from the weed beds off Jerry’s Marina. Tawas River bass and pike were caught in the lower river. Weekly Fishing Tip: Hook, Line & Sinker – learn to fish with the DNR! Have you ever wanted to learn to fish? Join the DNR for “Hook, Line and Sinker”, a weekly fishing program conducted by staff at more than 30 state parks and fish hatcheries in Michigan. The DNR will teach you casting and fishing basics and can provide a rod and reel to use if you don’t have your own equipment. Hook, Line and Sinker programs begin in mid-June and continue throughout the summer. Participants under the age of 17 do not need a fishing license. Programs are FREE; however, a Recreation Passport is required for park entry. Experienced, friendly instructors will introduce you to fishing in a relaxed and fun atmosphere. With step-by-step direction, you’ll learn fishing basics like knot-tying, setting up your pole, casting, selecting and using bait, and removing fish from the hook. After the 20- to 30-minute lesson, you’ll be ready to hit the water and exercise your new skills. To find out where Hook, Line & Sinker is offered, visit michigan.gov/hooklineandsinker.